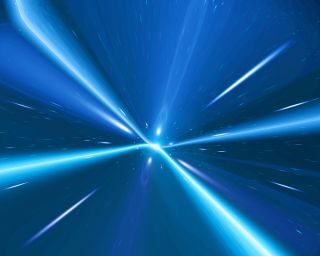 Time travel may be theoretically possible, but it is beyond our current technological capabilities. Paul Sutter is a research fellow at the Astronomical Observatory of Trieste and visiting scholar at the Ohio State University's Center for Cosmology and Astro-Particle Physics (CCAPP). Sutter is also host of the podcasts Ask a Spaceman and RealSpace, and the YouTube series Space In Your Face. He contributed this article to Space.com's Expert Voices: Op-Ed & Insights. "Hey, let's meet at the Bagel Cafe on Broad Street in an hour," you tell your friend, "because I'm really hungry for bagels." Without realizing it, you just described an event in space-time. Notice how there's minimal gap between the words "space" and "time." That's important. We're used to thinking of "space" as somewhat related to "time," but not intimately connected. If I want to meet you — to get bagels, for example — we need to specify the coordinates on Earth and the coordinates in time. But that's as deep as the connection goes. It's just another description we use to organize meetings or describe events in the past. About a hundred years ago, even top-tier scientists thought the same way. That was the legacy of living in the worldview of Galileo and Newton: an absolute reference frame against which all else is measured, and a master clock somewhere out there in the cosmos ticking away the universal time. Separately perfect and perfectly separate. Unfortunately, during the Relativity Revolution, led by figures such as James Clerk Maxwell, Hendrik Lorentz, Henri Poincare and Albert Einstein, the absolute reference frame and the master clock were the first up against the wall (as covered in my previous essay "Everything's Relative: The Discovery of Space-Time"). What was left after the carnage? If all motion is relative, and there are no absolutes, how are we supposed to think about space and time? What's the relationship? It wasn't Einstein who gave the answers, but one of his former professors Hermann Minkowski. Albert may have taught us relativity, but Hermann taught us how to think about relativity. "The views of space and time which I wish to lay before you have sprung from the soil of experimental physics, and therein lies their strength. They are radical. Henceforth space by itself, and time by itself, are doomed to fade away into mere shadows, and only a kind of union of the two will preserve an independent reality." Wow, gutsy statement. But Minkowski had math and evidence on his side, so he could afford to go all-in. He even admits how whacko his ideas sound, but he's arguing that the results of the Michelson-Morley experiments back him up. Well, I should say the lack of results from the Michelson-Morley experiments. Using the best light-interfering gizmos the 19th century had to offer, they failed to find any evidence for a changing speed of light as the Earth moved through its orbit. Hence, no evidence for an aether, and no absolute reference frame or a master clock. Minkowski: 1. Haters: 0. If that paragraph didn't make any sense to you at all, then you really need to (re-)read my last essay. Go ahead, it's only a click away. So here we are. No time for space and no space for time. We simply can't think of them as independent concepts. There can be only one: space-time . The framework developed by Minkowski solidified the concepts developed by Einstein and put them in a nice, tidy little package, where time and space are on equal footing, as I explain in this video. And by equal, I really mean equal, and that equality lets us interpret all the strange shenanigans of Einstein's Special Relativity. Here's an example: time dilation. You may have heard the phrase "moving clocks run slow." If you've never heard the phrase before, well, you have now, so we can proceed. Let's pretend you have a twin. If you really do have a twin, great, you can perform this experiment in real life. Shove your twin into the nearest interstellar spaceship. If you don't have one handy, ask Elon.Tell your twin to rocket off to some distant star at close to the speed of light, then return. Off your twin goes. The bit of light representing your twin's fantastic adventures grows smaller and smaller, receding into the blackness of space. You live your life, bored, lonely and wishing you had reversed roles in this experiment. Time passes. Years. Decades. You're gray, wrinkled in places you never knew you had, and have managed to grow a crop of grandkids. One night, your twin's speck of light returns to the night sky, grows brighter, then flames into Earth's atmosphere. The capsule opens, and out walks your twin. Your…surprisingly youthful twin. No wrinkles. Not a hint of gray. Looking barely any older than the day your twin left. Sci-fi? No. Sci-fact. Your twin has made a trade only possible in the world of space-time: a trade between moving in time for moving in space. Let's back up a bit to see what's going on. When you walk around, you can choose any direction you please. That's kind of the point of walking around. You maintain a constant walking pace but can put that walk into any direction or combination of directions. You can walk straight north, following a compass. Or totally east. Or split 50-50 between north and east. Or mostly north and a little east. Whatever, you pick, it's cool, and you don't even notice. Your total speed stays the same, but it's split up between two directions, and the more you put in one direction the less you put into another. It's pretty simple and obvious for space. As it should be for space-time. Here's a way to think about it that makes it all work: we're all moving through space-time at the same speed. A constant speed. The speed of light. Notice that I said space-time and not just space. Everything is moving through four-dimensional space-time at the same speed, but some things are moving more in space and less in time, and vice versa, as easily as you can move more through north and east, and vice versa. So what did your twin do? Your twin traded motion in time for motion in space. The faster one moves in a spaceship, the slower one moves through time. And I don't just mean the perception of time. I mean actual, biological, physical time. Your twin didn't age as much as you simply because of that movement at close to the speed of light. How many clicks to get to the center of the Milky Way? This means that you can reach the center of the Milky Way galaxy in only a couple dozen years. Yes, you! No, I'm not joking around! You just need to provide a nice constant acceleration — say 1g, the same acceleration you feel from the Earth’s gravity. (Note: this trip may be challenging to engineer, but that’s not my department.) You'll never crack the speed of light, but you'll inch ever closer to it. And the faster you go, the slower time passes for you. Everyone stuck on Earth will be counting the millennia, but in this video I show how you'll get there in only a lifetime. Just don't bother coming back, because…well, everyone you know and love will be long dead. This all hangs together because of another face of relativity. Not only do moving clocks run slow, but distances get shorter the faster you move. That star that looks so far away when you're sitting still? Boost yourself to 90 percent of the speed of light and — hey! — that star isn't so far away anymore. Your twin riding on that spaceship didn't notice any super-slow-mo effects; instead he or she just saw a squished-up universe. Seems too weird? Too bad. This is the way our universe appears to work. This is the price we have to pay for abandoning a cosmos with a fixed universal reference frame and a master clock. Experimentally verified, over and over, for a hundred years. We've tested it with super-precise atomic clocks on airplanes. Subatomic particles get extended lifetimes when boosted to incredible velocities. GPS systems need to account for it when giving you accurate positions. Special relativity — and the views of space-time that go along with it — pass every test we can throw at it, and we've thrown a lot. In a relative universe, clocks run slow, rulers shrink, and space can be traded for time, as easily as turning a corner. Learn more by listening to the episode "What is spacetime? (Part 2)" on the Ask A Spaceman podcast, available on iTunes and on the Web at http://www.askaspaceman.com. Thanks to many people for all the questions about space and time that led to this episode! Ask your own question on Twitter using #AskASpaceman or by following Paul @PaulMattSutter and facebook.com/PaulMattSutter. Follow all of the Expert Voices issues and debates — and become part of the discussion — on Facebook, Twitter and Google+. The views expressed are those of the author and do not necessarily reflect the views of the publisher. This version of the article was originally published on Space.com.